Separate croissant rolls into eight sections. 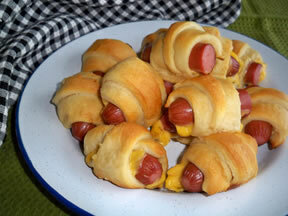 Wrap hot dogs in cheese. 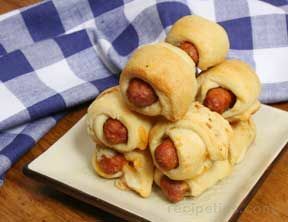 Lay cheese covered hot dog on top of flat croissant dough and roll until hot dog and cheese are covered with dough. Continue process for remaining hot dogs and cheese. Baked at 375 degrees F. for 12-15 minutes. "I will make these once in a while for my kids after school. They love them with the cheese in them. 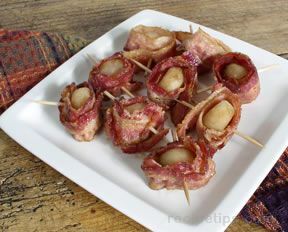 Easy snack." 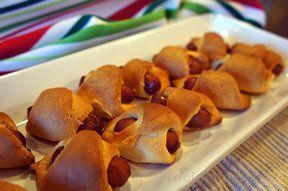 "I make these for a Super Bowl party and the kids there loved them. The adults even thought they were good. I thought they would be tedious to make but they were not bad at all."